To get an overview of the major insolvency and restructuring-related legal developments in 2015 and a prediction of how the landscape may shift in 2016, Hong Kong Lawyer reached out to Ian Mann, head of Harneys’ Offshore Litigation and Restructuring department in Hong Kong. 2015 was an incredible year for BVI shareholder disputes with significant trials being heard in the Commercial Division of the BVI Court, as well as a number of filings setting the scene for substantial trials in 2016. The disputants are generally Asian resident shareholders of BVI companies which in turn own assets in Asia. The disputes concern claims that the majority shareholder has acted so as to unfairly prejudice the rights of the minority shareholders. Two significant cases involve complex questions of the valuations of real property assets belonging to the company. Expert evidence has been a new feature of 2015 requiring valuation methodology experts to attend the BVI Court for cross examination. London Queen’s Counsel continued to appear in the BVI Court on a near-industrial scale, adding significantly to the quality of advocacy and cross examination. Court users took comfort from the fact that they are free to choose the very best barristers in the world with limited interference from the local Bar. This is not the case in all jurisdictions where choice of barrister can be restricted by regulatory requirements. A second Commercial Division judge, Gerard Farara QC, was appointed to manage the busy Court list from 1 November 2015. In an appeal from the BVI to the Privy Council in London, rather unusually, significant interim relief was sought. One does not normally see urgent interlocutory scuffles at an appeal stage, especially at the highest level of appeal. 2015 was also incredible year for cross-border restructuring of companies listed in the Hong Kong stock exchange, but which are incorporated in the Cayman Islands and Bermuda. The Grand Court of the Cayman Islands took centre-stage over Bermuda this year with significant restructurings of a number of Cayman Islands incorporated companies. Of particular note was a new trend for significant dispute as to the choice of Court appointed provisional liquidator for the purpose of the restructuring. Some parties submitted that certain proposed appointees were suffering from an existing professional conflict or were not ideally placed to restructure and rehabilitate by reason of the location of the company’s assets. A further new feature of 2015 was the blurring of traditional lines between the appointment of a restructuring provisional liquidator for company-driven restructuring on the one hand, and an all-out shareholder dispute on the other. In some case the processes worked in tangent with each other. In an already widely-discussed decision of the Cayman Islands Grand Court, Mangatal J parted company with one of her fellow judges by declining to follow Jones J’s first instance judgment in the recent Cayman Islands case of Re China Milk Products Group Ltd.  and striking out a winding up petition filed by the directors of China Shanshui Cement Group Limited, a Cayman Islands company listed on the Hong Kong Stock Exchange, for lack of standing. The judge felt unable to endorse the Court’s strained construction of s. 94 of the Companies Law in China Milk, which for the last four years has relieved directors of insolvent Cayman Islands companies of the obligation to seek a resolution of the company’s shareholders in general meeting before filing a winding up petition (and, by extension, applications for appointment of provisional liquidators) in the Cayman courts. In the case of Rhone Holdings, LP the Grand Court of the Cayman Islands handed down its written reasons for striking out a winding up petition under s. 95(2) of the Companies Law (2013 Revision). This is the first time the Grand Court has decided the fate of a petition based on the application of s. 95(2), which provides as follows: “95(2) The Court shall dismiss a winding up petition or adjourn the hearing of a winding up petition on the ground that the petitioner is contractually bound not to present a petition against the company.” Based on the applicability of s. 95(2), the Court, following a two-day hearing, found that the Petitioners were contractually bound not to present a winding-up petition, and ordered that the petition be struck out as an abuse of the process of the Court with indemnity costs being awarded to the Respondents, represented by Harneys. The Court of Appeal subsequently confirmed the Grand Court decision that provisions in investment agreements contracting out of the right to present winding-up petitions are enforceable and not contrary to public policy. Predictions for 2016 will be increased asset tracing and recovery work following fraud. In the honeymoon period of investing in emerging markets, when returns were comparatively phenomenal, investors would put up with fraudulent dispositions of their target company’s investment assets – they were still making great returns. In the era of the PRC Government’s anti-graft campaign and following some very high-profile foreign investment disasters throughout North Asia and South East Asia, the climate has changed. Over the years we have been amazed at the reluctance of investors in Asia to pursue claims such as breach of fiduciary duties, knowing receipt and dishonest assistance. We would identify fraud and assume that we would be retained to hunt down assets and then be sorely disappointed. In the last 18 months, the tide has changed and claims are on the up at last. The reasons for this are hugely complex and not capable of a linear exposition, but a slowing PRC economy and the drop in commodity prices are significant contributing factors. 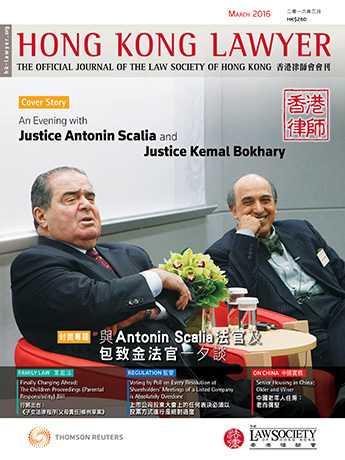 A second prediction is that following a line of hugely helpful Hong Kong case law in 2015 that sees the common law flexing its muscle to allow offshore liquidators to seek orders and co-operation from the Hong Kong Court, 2016 will see the first contemporaneous Cayman Islands Court and Hong Kong Court video hearing. Such a hearing will involve parties’ legal representatives in both the Cayman Islands and Hong Kong holding simultaneous Court case management conferences with both a Hong Kong and a Cayman Islands judge. The purpose of such a hearing will be to co-ordinate efforts in a cross border restructuring in real time so that time consuming letters of request and other communication between judges need not be driven by cumbersome individual Court applications.